Taken at face value, the article appears to be suggesting the pundits’ belligerent media statements are a nuisance to the top leadership group as a whole, a fly in some proverbial ointment they were planning to heal Sino-Japanese relations with. Wang is not specific about which policy decisions he sees as having been “interfered” with. But the implication is that by raising public attention, expectations and anti-foreign animosity, the pundits are creating ‘audience costs’ that constrain the leadership from mending relations with Japan as they otherwise would like to. All of these remarks appeared in prominent official media and were widely republished online (and this is certainly not an exhaustive list) during the same time period the PRC leadership, including Xi Jinping himself, received a succession of Japanese politicians as guests in Beijing, accompanied by positive coverage of Japan in PRC state media. Meanwhile, the number of entries by PRC ships into the 12nm territorial waters around the Diaoyu Islands noticeably decreased. Additionally, party and military officials made a number of reassuring public statements, such as Deputy Chief of the PLA General Staff Headquarters Qi Jianguo’s vow that “China will never cause a maritime conflict by choice,” and state-run media published commentaries explicitly dismissing the idea of a Diaoyu War. This coexistence of warlike military expert statements and conciliatory policy initiatives indicates that the high-level decision-makers did not perceive the PLA experts’ commentaries, or any associated ‘audience costs’, to be a constraint on those initiatives — at that point in time. It is possible that Lt-Gen Wang’s article itself reflects a high-level decision to restrain or moderate “hawkish” voices; if so, things have changed since January-February, when such measures were evidently not considered necessary. But could the article be a sign of leadership disagreement over Japan policy, rather than consensus? The deleterious effects on decision-making that Lt-Gen Wang’s article referred to may emerge in conjunction with periods of elite disagreement — a scenario that also accords with the Reilly/Fewsmith & Rosen theory, which holds that elite divisions “open the door” to less conventional influences on policy like public displays of nationalistic sentiment. I was recently talking to a student here in Perth who said his father was an officer in the Nanjing Military Region that Wang recently retired from, and mentioned that it was a significant PLA power base of Wen Jiabao, the CCP’s best-known (alleged) “liberal”, who was pictured at Tiananmen Square behind Zhao Ziyang. So perhaps the “interference with our high-level decision-making” that Wang refers to could be code for “putting conciliatory/rational voices among the leadership at a disadvantage”. The reference to interference with “deployments 部署” is even more mysterious and fascinating, as it may invoke an element of party-military relations. Again, precisely which deployments Wang is referring to is not clear: could it be a reference to the PLA-underwritten CMS plane flight over Diaoyu in December? Or the policy of ongoing regular entries into the 12nm territorial waters by ships from civilian agencies with close working relationships with the PLA? Or could Wang actually be linking hawkish punditry to the radar-lock incidents in January? The latter incidents, two of the most serious encounters yet seen in the Diaoyu dispute, sharply punctuated an otherwise clear warming trend in Sino-Japanese relations. Both involved PLA warships locking weapons-control radars onto Japanese military assets around 100km from the disputed islands — a helicopter on January 19, and then a destroyer on January 30. Anonymous PLA sources have since told Kyodo that both incidents were the operational initiative of the relevant Chinese navy captain. Western military officials and diplomats have told me that they have evidence, including from electronic intercepts, that shows that the movements of Chinese boats and ships were micromanaged by the new taskforce chaired by Xi. A princeling friend of the Xi family told Garnaut that that Xi Jinping has been applying lessons he learned from watching Deng Xiaoping take control of the PLA by attacking Vietnam in 1979. If Xi did sanction the radar incidents, this does not necessarily preclude them from being the “deployments” Lt-Gen Wang referred to as having been affected by the PLA pundits’ bluster, though it suggests a different mechanism once again. It’s hard to dismiss the possibility that significant constituencies within the PLA would strongly favour confrontation over cooperation with Japan, not only in order to test out their newly-acquired advanced hardware but perhaps even more due to the nature of the CCP’s ideological control. Outside observers frequently mistake academics at PLA-run institutions for actual serving military officers. Much like the PLA’s song and dance troupe, they aren’t, and, unlike Wang Hongguang, most of them never have been. Major-General Luo Yuan says he fought in Laos in the early 1970s, but he came back to Beijing to begin his academic career in 1978, just before China went to war with Vietnam. The online biographies of PLA Navy “Rear Admirals” Zhang Zhaozhong and Yin Zhuo indicate they are career academics. And the closest PLA Air Force “Senior Colonel” Dai Xu seems to have come to flying a fighter jet is looking after the navigation platform at a training college. It’s clear they wield little operational influence of their own, in spite of their impressive-sounding ranks (and even princeling status in the case of Luo Yuan). But a major question concerns the extent to which their sabre-rattling represents constituencies within the party-military establishment that might actually favour aggressive policies. Col. Dai is a core member of China’s strategic community and his views are backed by a huge following in Chinese military circles. 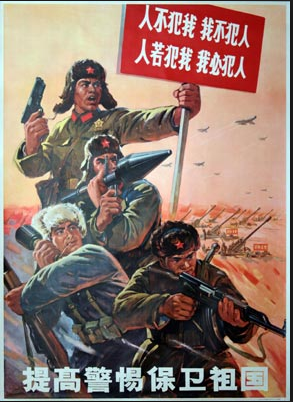 Although i was initially unconvinced by Miles’ argument, and remain deeply skeptical of Dai and his brethren’s status as strategists, their polemics could well give voice to common sentiments among PLA soldiers and officers, who are subject to particularly intense political indoctrination. 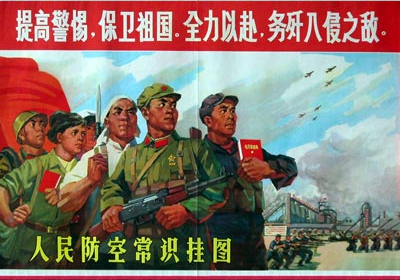 For while “patriotic education” and “national defense education” is famously supposed to be dished out to all school and university students, that project pales in comparison with the importance to the CCP of maintaining ideological control of the PLA. The presence of external threats to “maintain vigilance” against is undoubtedly a key part of the CCP’s ideological justification of its rule, an approach that is often surmised as a “shift to nationalism”. Such ideas of course permeate the extensive PLA propaganda system. A recent example from the PLA Daily, the Chinese military’s official newspaper, was an article titled ‘US internet strategy: fake cooperation, real confrontation‘, which cast the internet as a site of intense military struggle against foreign aggression. PLA General Staff Headquarters Deputy Chief Qi Jianguo’s important January article in Study Times, which we might assume that the PLA have been made to study closely, identified “Five Problem Areas”, among them Japan’s “obvious” turn towards right-wing politics. “Western countries“, meanwhile, are deploying techniques of “soft penetration” in order to “occupy minds” in countries like China. The implication is that anyone in China — particularly if you happen to be a soldier — is liable to become a part of the foreign plot to thwart China’s rise, simply by wavering in their loyalty to the CCP. But having legions of fans and powerful patrons is different to actually influencing policy decision-making. It’s plausible, likely even, that the genuinely powerful backers of Dai Xu and his ilk could admire their militant spirit, or see it as useful, without ever considering their suggestions as serious policy options to be advocated. Meanwhile, online discourse suggests the wider readership (whether or not this includes many PLA soldiers) may obtain a sense of empowerment from their apparently alarming diatribes. Lt-Gen Wang argument appears to be that the PLA media pundits’ impact on policymaking is mediated by the “popular sentiment 民意” that their war talk incites. Just as specific examples of policies and deployments were absent from the article, i would dearly love to know which manifestations of popular sentiment he has in mind. Presumably it’s not the anti-Japanese street protests in August and September last year, since they were clearly not whipped up by a few loud-mouthed military academics. I feel like i’ve engaged in enough speculation for one post, but if you have any ideas on this or Lt-Gen Wang’s other comments, please do help me out in the comments section, or via gmail (achubb@). On the internet, deciding what “popular sentiment” relates to military “experts” depends largely on where one looks. Both Luo Yuan and Dai Xu have recently been subject to intense ridicule among the relatively sophisticated Weibo crowd and on the liberal-leaning NetEase news portal. This contrasts starkly with the overwhelming agreement their hardline stances have traditionally received on mainstream news portal comment threads and, of course, their blogs, which are lightning rods for angry online nationalists. Comments on Lt-Gen Wang’s article on the Huanqiu website offered a compelling glimpse into the variation in public interpretations of the PLA pundit phenomenon, with responses ranging from relieved agreement at seeing the issue raised (“this person understands what’s going on”), to Buddhist appeals against harming others, and the links between China’s “fascist” media-pundits and a “generation of poisonous youth”. mrx8603 [Chongqing]: Strongly demand the race traitor Vice President ‘Wang Hongguang’ step down! This high-maintenance, useless-in-war [person’s] fallacious remarks are obviously at odds with CMC Chairman Xi’s demand for the PLA to ‘prepare for combat’! If the PLA don’t prepare for war and talk about war, how can the production and living environment of the Chinese people be guaranteed? 冲锋队 [Tianjin]: The entire article by Wang Hongguang is full of defeatism, extremely harmful to the youth! Extremely harmful to national defense construction! yeming1 [Jinhua, Zhejiang]: This person’s purpose is to shut down military experts like Li Li and Zhang Zhaozhong who the people like, and even force them off CCTV so that we cannot hear the military’s voice of righteousness and bravery. If these people’s plans are allowed to succeed, China will be all flowers and songs, and once the enemies have sharpened their knives, it will be a fattened pig. The evident anxiety of these commentators may illuminate an important element of the PLA pundits’ market appeal: stoking of fears over China’s vulnerability to vicious and all-powerful external enemies, and at the same time casting the alarmed readership themselves as the solution. [†] CCP-PLA doctrine does in fact contain a fairly unequivocal answer to this question. For even as official propaganda points to the conclusion that hardline measures like military action are called for in the East and South China Sea, the important concept of “protecting the period of strategic opportunity” points the other way. This concept was prominently deployed in PLA General Logistics Department Political Commissar Liu Yuan’s public denunciations of the idea of a Diaoyu War earlier this year. Indeed, it has scarcely been noticed by foreign commentators, but external threats were not really the main theme of Qi Jianguo’s article either. The “Five Problem Areas” that have received so much attention outside China, appeared tucked away in the middle of a very long paragraph near the end — a paragraph that began by explaining the “Four No-Changes”, each presented as a good sign future peace. The article also repeatedly emphasized the notion that common interests with the US were increasing over time, and that “peace and development remains the theme of the age”. The argument, however, is a cold rational calculation, whereas the content of much CCP-PLA propaganda is strongly emotive. Hence, i would hypothesize, the “period of strategic opportunity” argument would have much less purchase as it moves further down the chain, away from the decision-makers or commanders for whom the stakes are highest, and whose impetus for prioritizing rational calculation is therefore strongest. Great insights again, from SSC: “Outside observers frequently mistake academics at PLA-run institutions for actual serving military officers. Much like the PLA’s song and dance troupe, they aren’t, and, unlike Wang Hongguang, most of them never have been. Major-General Luo Yuan says he fought in Laos in the early 1970s, but he came back to Beijing to begin his academic career in 1978, just before China went to war with Vietnam. The online biographies of PLA Navy “Rear Admirals” Zhang Zhaozhong and Yin Zhuo indicate they are career academics. And the closest PLA Air Force “Senior Colonel” Dai Xu seems to have come to flying a fighter jet is looking after the navigation platform at a training college.